In this technology age, computers and the internet is indispensable in running any business. That is especially true in art licensing. Manufacturers want art in digital format, most art submissions are sent via the internet, art images are manipulated into collections with a computer, and the variety of records needed to license art is done on the computer. 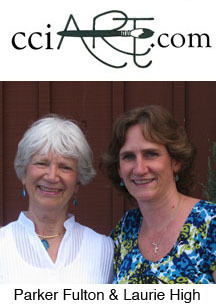 Read how the advances in computer technology have helped mother / daughter team Parker Fulton and Laurie High of Creative Connection, Inc. manage their art licensing agency. By Laurie High, V.P. Creative Connection, Inc. The Art Licensing business has dramatically changed over the last ten years with advances in computer technology. Most communication, record keeping, and information gathering is now handled via computer. Utilizing Photoshop to rework art and sending digital files over the Internet is expected by manufacturers. Also, many social media venues are now available and can create additional opportunities in this field. As an Artists' Rep., keeping up with an array of tasks is important to the health and growth of the organization, including: marketing, advertising, creating promotional materials, follow-up, trade shows, contracts, job orders, billing, royalty processing, social media including website, blogs, Twitter, Linked-in, Facebook, and more. Here at Creative Connection, Inc., there are just two employees: Parker Fulton, President and myself, Vice President. My days are spent handling all of the above except for the majority of follow-up and blogs and twitter. Parker manages the follow-up. In addition, she is an illustrator herself so she must spend considerable time at the drawing table. I did set up a twitter account some time ago but only managed one tweet so that account is currently dormant. According to seminars we have sat in on, a blog is a must as is Twitter and Facebook, but then so is an up-to-date company website and Linked-in. Marketing can be a full time job in itself, and I have not yet mastered the art of not sleeping so that I can participate in all of the other necessary social media. I do find a few minutes to read through the Linked-in comments each day and find them invaluable. The links posted to personal blogs and industry related articles have been very helpful to me in my business. Finding out what works and doesn't work by reading and participating in the various discussions also saves me research time. So, if Linked-in helps our business this much, I can only imagine how branching out into other social media would be helpful too. Perhaps Linked-in will teach me how to manage everything. I'm waiting! I've just recently created a company Facebook Page, so that is in the preliminary stage and time will tell the value of this venture. Parker and I are very thankful for the rapid technological advances of the past few years. We used to print hundreds of color copies for promotions, manually recording everything being mailed out to our clients. Current technology allows us to easily condense 100 images in a zip file and send immediately with the touch of the send button. Thumbnails are quickly printed out for reference of what has been sent. The expenses and time saved between yesterday and today are hard to grasp. But, with the technological advances comes the expectation for more, so time is not freed up; it's filled up. Since we are able to and everyone else is able to, we must market more often and more creatively. In addition, the talent pool is immense so if we do not keep up with the expectations then we are going to fall behind. That includes the necessity for a presence in the social media available to us. Comments are welcome. Please write them in the below comment section. Just Love this Article Thanks For Sharing.